In this second part of my short series on dogs in composition, lets compare two paintings. Both painted in France in the 1860s, each of these pictures shows figures at a table, and each artist has included a single dog as a key part of the composition. But this is perhaps where the similarities end. 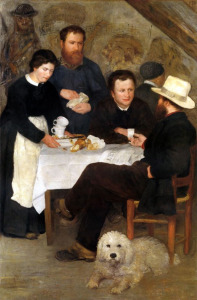 Painted when he was a young man and not yet famous, Renoir’s “At the Inn of Mother Anthony” shows the artist in thoughtful discussion with fellow painters. The inn itself was a meeting-place for artists of the Barbizon school and for those who had travelled to the Fountainbleau forest to paint outdoors. Artists have painted murals on the walls, and even the maid is portrayed as if she were part of the group, listening to what is being said. While the four main characters seem engrossed in their own conversation, the only face making any emotional connection with the viewer here is that of the dog. The animal’s appealing, frontal image draws us into the picture. The curve of the dog’s head is echoed by curved shapes throughout the painting, and this keeps my interest, sending my eye up and around the picture, though ultimately giving no clue as to the content of the artists’ discussion. Looking at this image, I am left with a sense of discord, colluding with the dog under the table while the intellectuals talk above our heads. I wonder whether this was Renoir’s intention? 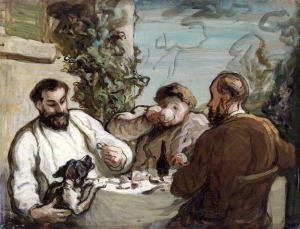 Two years later, Daumier’s “Lunch in the Country” made similar use of bold, black and white shapes. In this case, however, the collusion seems to be between the dog and its owner. Despite the lovely setting of countryside villa with lunch and wine, the hungry creature rearing up above the smart white tablecloth here hints at simmering animal instincts. There is such a close connection between this dog and owner (the man on the left, dressed all in white) that, rather than putting his guests at ease, his focus is all on the animal. With elongated, slightly curved features, this man’s expression combines both indulgence and potential malevolence. These facial features create distinctive shapes (his highlighted left cheek, and the space between eyebrow and eye) that are repeated in and around the dog (look, for example, at the space between the animal’s two front legs). The closely-comparable black and white paint handling within dog and owner further sets these figures apart from the two guests. Certainly for the nervous-looking man with the raised coffee cup, this lunch in the country appears to have been a fraught affair. Not only a painter but also a great caricaturist, Daumier was surely making some social comment here. 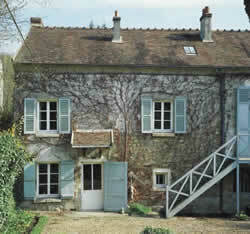 According to Lilian and Dieter Noack, Daumier started spending his summers in Valmondois in 1853 and a house was possibly purchased for him here in 1868 (the year of this painting) by the artist, Corot.